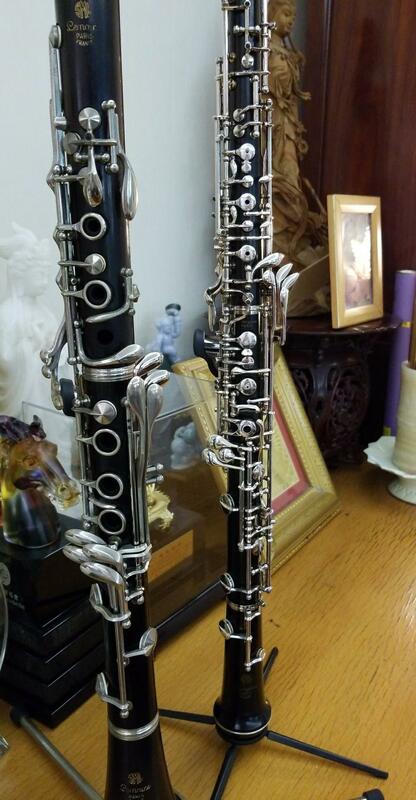 I had an SML Lemaire clarinet sent to me from Hong Kong as the owner (Bboard member DD) wants a LH Ab/Eb key fitted to it with the extra touchpiece in the same position as the LH low D key on a basset horn/low C bass clarinet. All the parts have been made and the next thing to do is silver solder them together, do some final fitting and adding spring catches, pinning the ends of the LH F/C lever to the steel and finding someone who can do nickel plating so it matches the plating on the rest of the clarinet. Just about to silver solder all the bits together. I hope this will go right first time at this stage as things don't look so good and need a lot of tidying up if several attempts have to be made. Preparation is key as are steady nerves. When I started clarinet some 30 years ago the left Eb/Ab lever was not a common feature. Haven't played seriously after high school, only to have a little revival in recent years, I noticed the additional left Eb/Ab lever in some of the newer models. I found it to be a valuable addition, but when I tried them, due to my rather short pinky, I struggle to reach such lever in the 'traditional' position. Then I did some research and found the legendary Bboard member Chris who did a similar retrofit project to a Peter Eaton clarinet. And so I approached Chris. Chris is so kind to squeeze his busy schedule for this project! I guess with Internet and all those modern technologies, we are now having a global clarinet community! I have fitted the LH Ab/Eb lever so the touchpiece is in the usual position - either sharing the same pivot as the LH E/B lever and running along the outside which is a relatively simple addition, or in the more traditional manner with its own pillar and running in between the LH levers which is far more involved. 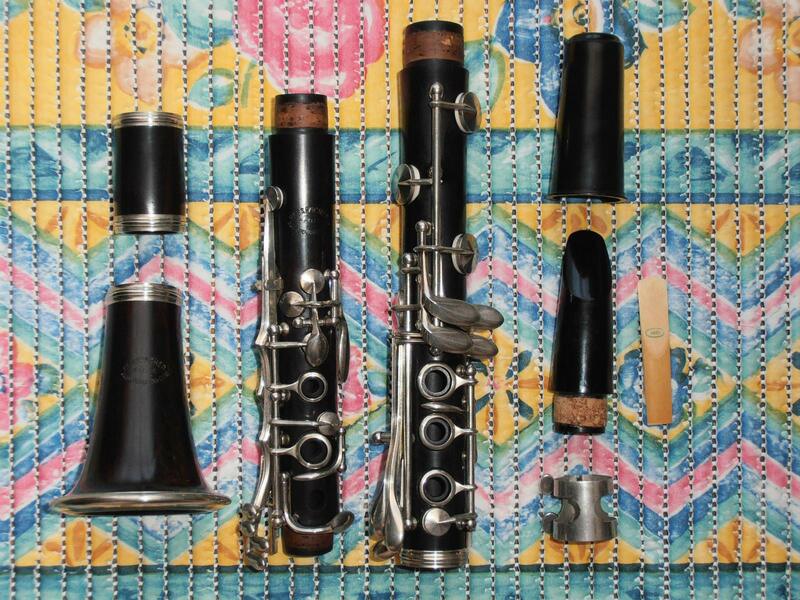 Attached are two photos - top one is on a Selmer (USA) Signet and the lower one is copied from the older Buffet design and added to a Masspacher (Couesnon) C clarinet (which I also fitted the LH forked Eb/Bb mechanism to). 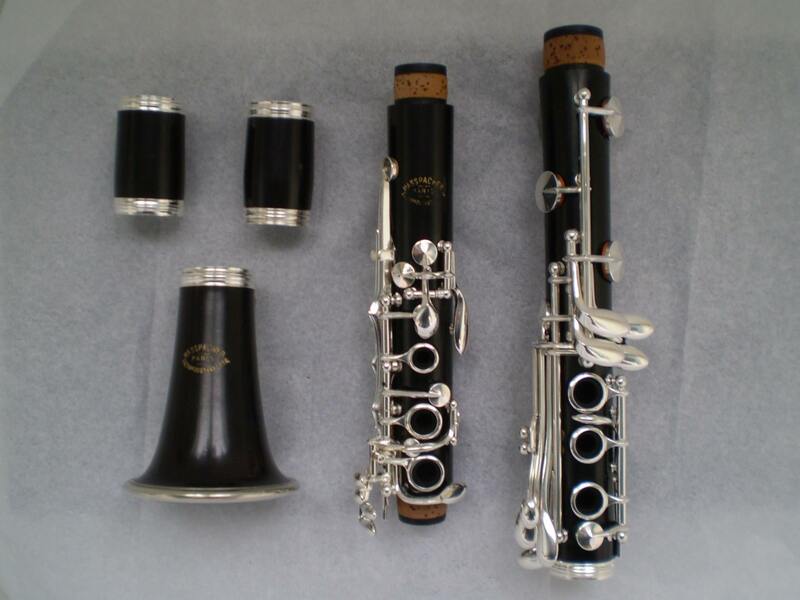 Attached are before and after photos of the C clarinet. I was considering adding a Patricola-style articulated C#/G# key to it as well, but there's not a lot of room to fit it. Looks like the ultimate Klezmer machine! Dont know how to send private messages on this bb. So i hope you dont mind me asking. What would fitting a lh ab/eb lever on the outside (the easy way as you said) cost? Just a ballpark figure? I bought this C clarinet as I missed out on a Selmer Series 9 full Boehm C clarinet for sale in Montreal - that would've been perfect as I play full Boehms anyway, so it will have all the extras already fitted. But the owner wasn't prepared to send it to the UK which was a shame, then I saw this one on sale in Portugal not long after - I think it's the same as a Couesnon Monopole. After the extra keywork was made I had it all silver plated by the company that does Buffet's plating, so it's the same sort of quality of plating you'd get on a Prestige. The funny thing with this Masspacher/Couesnon is the barrel sockets are both exactly the same diameter and depth, so the barrel can be used either way up. I made a longer barrel as the original one is too short for me - I used Selmer socket rings (mouthpiece socket) as they were the right diameter rather than turning up new socket rings. That can always e done in time. The barrel was made from a rejected Howarth barrel which had a slight flat on one side. The first instance I saw of this type of LH Ab/Eb lever was in the '80s when a Buffet Prestige came in with this key already made for it but not fitted, so I put it on the clarinet for its owner. 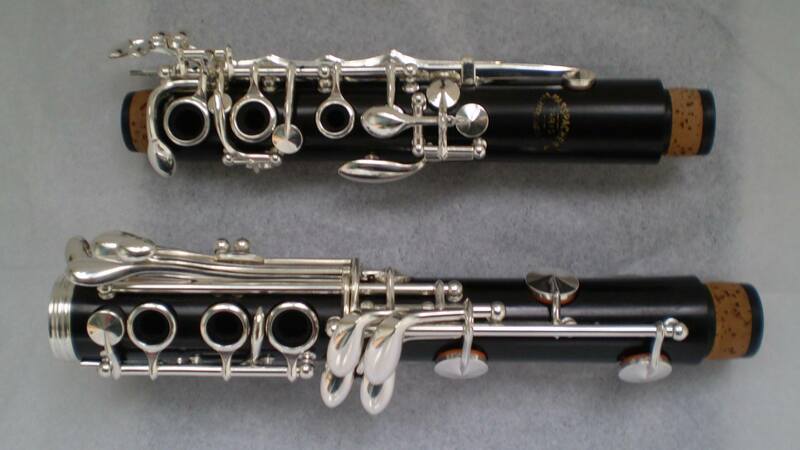 After that in the early '90s, Howarth offered it on their S1 clarinets as an option. They later fitted the touchpiece in its usual location as more players would be familiar with that. The usual position of the LH Ab/Eb lever has generally been with its touchpiece above the other LH levers - both on full Boehms and also German and Oehler systems. I think some tarogatos even have the LH Ab/Eb lever there too.